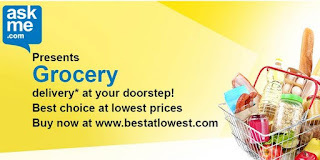 Welcome back, today in this post i will provide you with askme Grocery Coupons codes 2016, askme grocery is indian fastest growing online grocery shoping portal. the best part is that you will receive your product within 4-6 hrs with COD available and a superb no question asked return policy. Currently Askme Grocery is available only in few metropolitan city of India. 2 ) FRIDAY15 : DEAL OF THE DAY (FRI): Get Flat 15% off on grocery products at AskmeGrocery. MAXIMUM Discount upto Rs.1000. Use code FRIDAY15. T&C apply. 3 ) DP10 : Lohri Special: Get Flat 10% Off on Grocery products at AskmeGrocery. Use code: DP10 & redeem the Offer. T& C Apply. If you have any query or doubts do let me know in the comment section below.